After you saw The Little Mermaid for the first time as a kid, was there anything you wanted more in life than to be an actual mermaid? Well, if that was your childhood dream, good news: You can literally go to mermaid school and learn how to swim like a fish-human hybrid.That's right: Thanks to the staff at World of Swimming, if you're based in either Michigan or New York, you have the opportunity to learn how to swim like a mermaid — and yes, you even get to wear a costume, complete with a glorious fin. Now, before we get ahead of ourselves, there are a few caveats to keep in mind: Unsurprisingly, when you learn how to swim like a mermaid, you are not learning how to, say, grow gills or extend your time under water without breathing. But the idea behind these mermaid classes is one of confidence, self-acceptance, and yes, learning how to swim with a bedazzled fin on your legs — which still sounds like a pretty great time, to be honest. Rebecca Fishbein, associate editor at Gothamist, took one of the classes in New York to see for herself what they involved. The New York location is based at none other than Brooklyn's Coney Island, which has long been home to a variety of classic boardwalk entertainments. So, of course you can learn how to swim like a mermaid right by the beach of this seaside getaway. Where else would you do it, after all? The class teaches you techniques both on the ground and in the water. As Lori Dorn explains at Laughing Squid, the merperson technique focuses heavily on core strength. But learning to swim like a mermaid is definitely not something that's only for certain physiques; it's for everyone. As Cookie DeJesus says in the Gothamist video above, swimming like a mermaid, "Helps me be me, to be free. No hangups, I don’t think about whether I’m fat, I’m skinny, I’m just a mermaid. And as a mermaid, I feel beautiful." And really, what could be better than that? Oh, and in case you have a wee little would-be mermaid in your, life, World of Swimming offers children's classes, too. If you really take to the water with this mermaid swimming, you can compete as a a member of a Finswimming Team. There are even world championship titles in finswimming. If you're not quite ready to compete, however, you can also book professional finswimmers for parties or, you know, to be your new best friend. 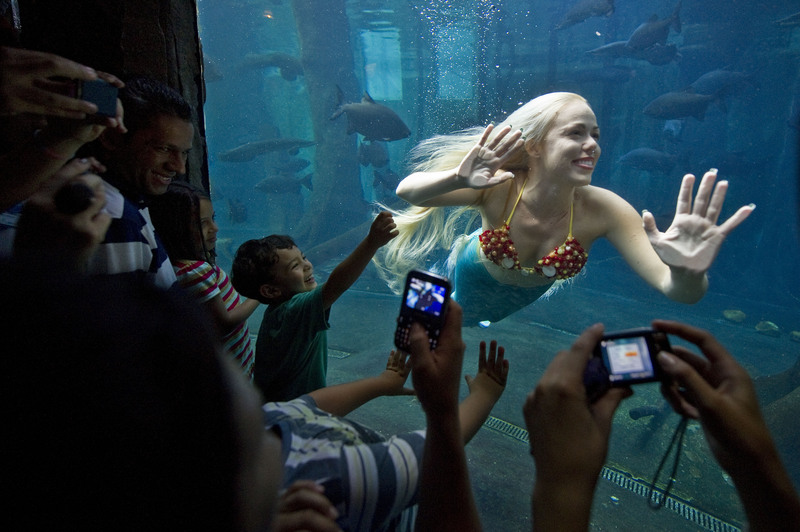 Because what is cooler than swimming like a mermaid, especially when the experience is all about body positivity and empowerment?